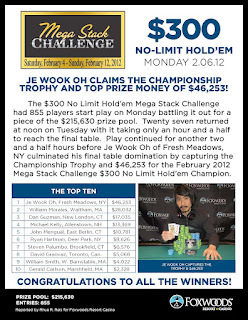 Jewook Oh is the winner of the $300 Mega Stack Challenge, beating out 854 other entrants and finally collecting $46,253 and the trophy. Amazingly, Jewook drew the live streaming table on day 1, so he played the entire tournament on the live stream. You can replay his path to victory from the beginning by clicking on "Watch Archived Video" at the top of this page. A full results list will be posted to www.FoxwoodsPoker.com shortly. 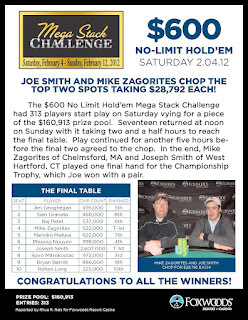 Our next live streaming event is the $400 Mega Stack tournament on Thursday, Feburary 9th at 11am EST. 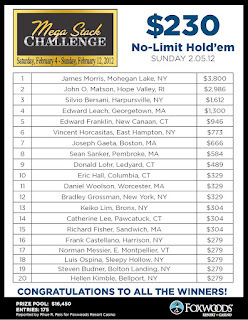 Tune in to www.FoxwoodsLive.com them to see if one of the 10 players seated at our featured table will go on to win it all! Entering heads up play, Jewook Oh had Steven Palumbo outchipped nearly 9 to 1. Steven tried to climb back, and was in good shape to double up when he called Jewook's all in, holding the [As][8s] to Jewook's [Qc][Td]. Good fortune continued to be on Jewook's side as the flop fell [Qc][9d][Qd], leaving Steven drawing to runner runner flush or bigger full house. The turn sealed the deal when it fell [Td], giving Jewook an unbeatable full house. 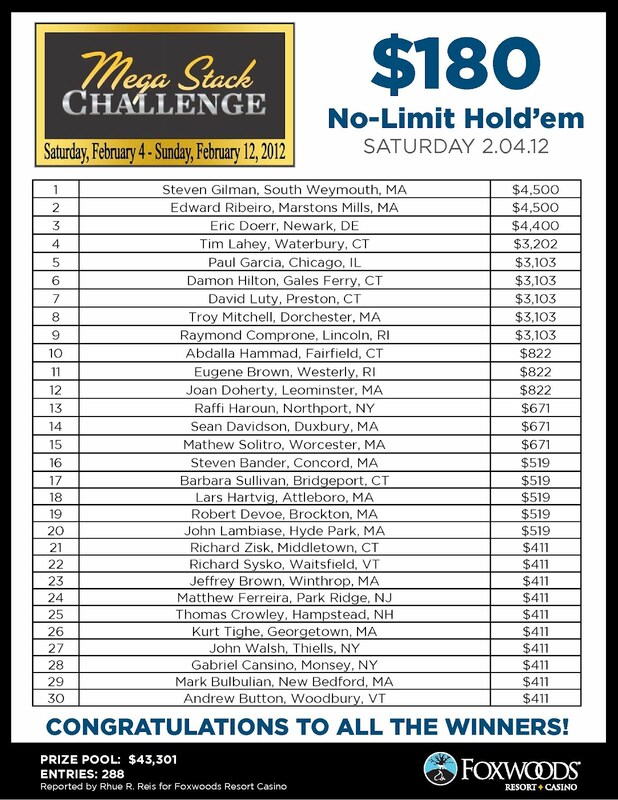 Steven will collect $28,032 for his 2nd place finish. In the third hand in a row with an elimination, Daniel Guzman fell at the hands of our killer, Jewook Oh. Daniel's [Qd][Jd] was in bad shape against Jewook's [Ah][Qs]. The flop was no help, falling [Td][2d][Th], but the turn [9s] gave Daniel an open ended straight draw. Again, there was pre-mature celebration on the river when it fell [9c], Daniel thinking he made the straight. 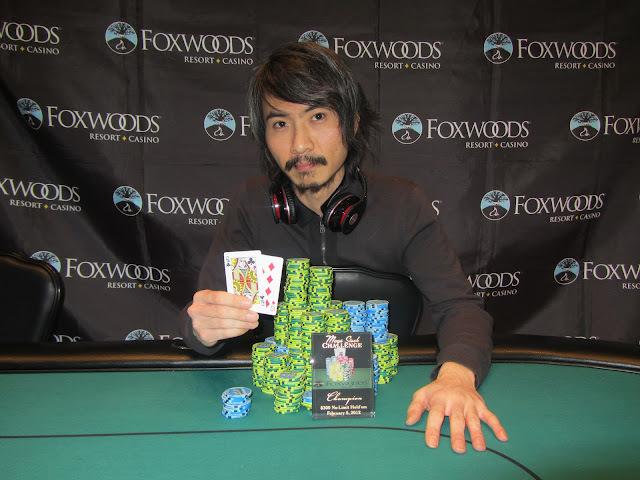 Unfortunately, he did not, and Jewook won the pot with two pair with an ace kicker. Daniel will collect $17,035 for his 3rd place finish. On the very next hand after John Mengual was eliminated, Jewook Oh eliminated yet another player. On a [6h][4d][Js][Ks] board, Michael Kelly check raised all in and again, Jewook insta-called. And again, Jewook had the best of it. His [Kd][4h] had made two pair against Michael's [Jd][Th] one pair hand. The river changed nothing, and Jewook had sent another player to the rail. 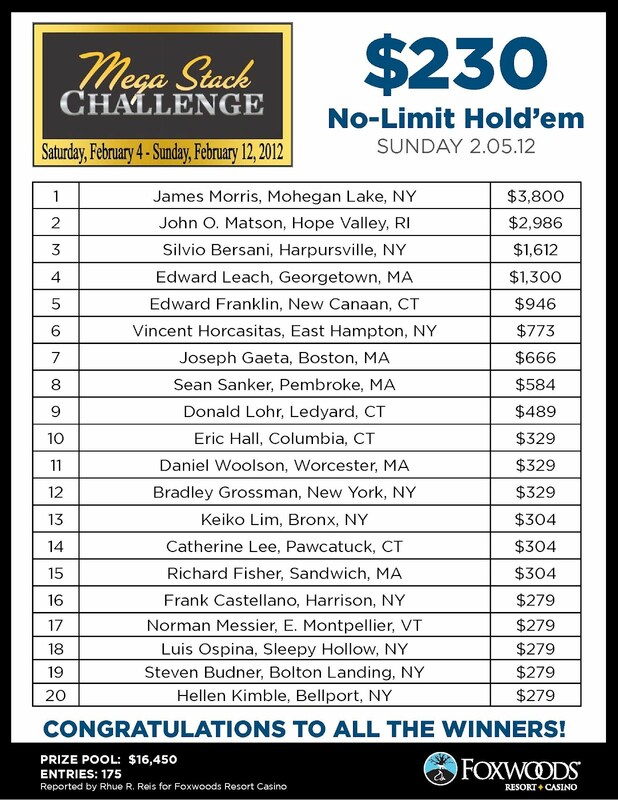 Michael will earn $13,369 for his 4th place finish. In a flash, John Mengual was eliminated in 8th place. With a full board of [Ks][Kh][6d][9c][4d] already showing, John moved all in against Jewook Oh and was snap called. John asked if Jewook had a king, and Jewook tabled his [Kc][Jh]. All John could show was the [9s][8s], which was no good. John will be taking home $10,781 for his efforts, however. Ryan Hartman was all in preflop holding the [Qs][Jh], but was dominated by his opponent's [Ad][Jd]. The flop came a disappointing [Ks][Ac][As], and the [8s] turn and [Kd] river missed Ryan's gut shot straight draw and put him out in 6th place. He will earn $8,625 for his efforts. 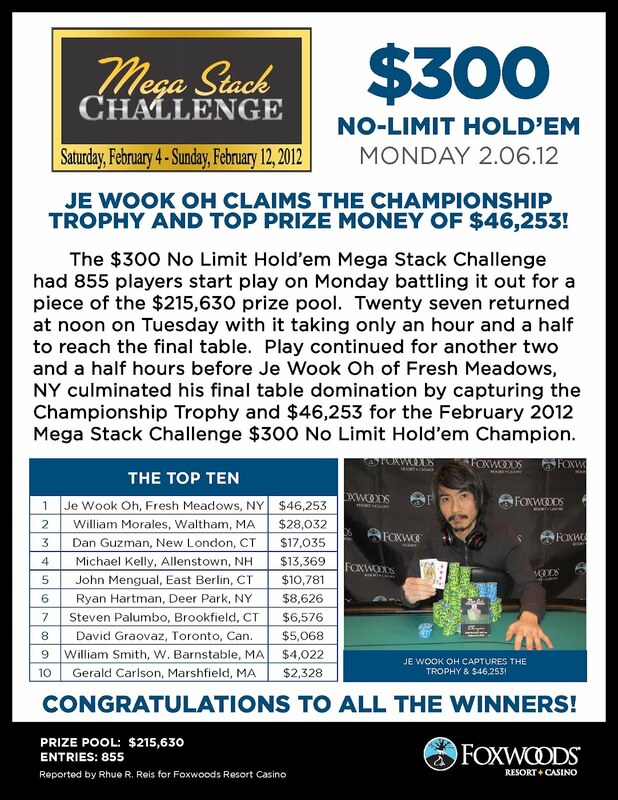 Jewook Oh raised preflop and was called by both John Mengual and William Morales called. When the flop fell [Qh][Ts][Qc], John checked to William, who moved all in. Jewook called, and John got out of the way, John was in bad shape with his [Td][9d] against Jewook's [Ah][Ad]. The turn gave John a few extra outs when it fell the [Jc], and the [Kc] on the river gave John cause for false celebration. Realizing he had made his straight, he strated high fiving his rail before the table pointed out that Jewook's hand made the bigger straight. It was a rough way for William to go out, but he will earn $6,576 for his 7th place finish. John Mengual opened the pot to 350,000 before William Morales tanked and finally min-reraised to 600,000. Action folded back to John, and he moved all in, and William snap called. John said, "You got me," as he exposed the [Kh][Th]. He was in pretty bad shape against William's [Qh][Qc]. John asked for a king or "a lot of hearts," and he got it when the board ran out [8s][2s][7c][Ad][Kd]. John has doubled up to almost 800,000. The players took an unscheduled 10 minute break as the action has been fast and furious. They are now playing 50,000/100,000 blinds with a 10,000 ante. The 7 remaining players are guaranteed at least $6,576 each, with 1st place taking home $46,253, the title, and the trophy. David Graovaz moved all in with [As][Jd] and was called by the superior [Ac][Ks]. When the board fell [6h][3s][3d][2d][Ah], David failed to improve his hand and was sent to the rail in 8th place. He will collect $5,068 for his efforts. William Smith finally moved his short stack in with [7d][4h] and was called by John Mengual's [Ah][Jh] with slightly more chips. It was a stressful run out for John, as shown above, but the best hand held up when he rivered a flush on the [9h][3s][6s][Kh][8h] board. William will leave this tournament in 9th place, earning $4,022 for his efforts. With 28 players left, the $300 Mega Stack Challenge has wrapped up play for the day. Tomorrow the tournament will resume at 12pm EST and play down to a winner. 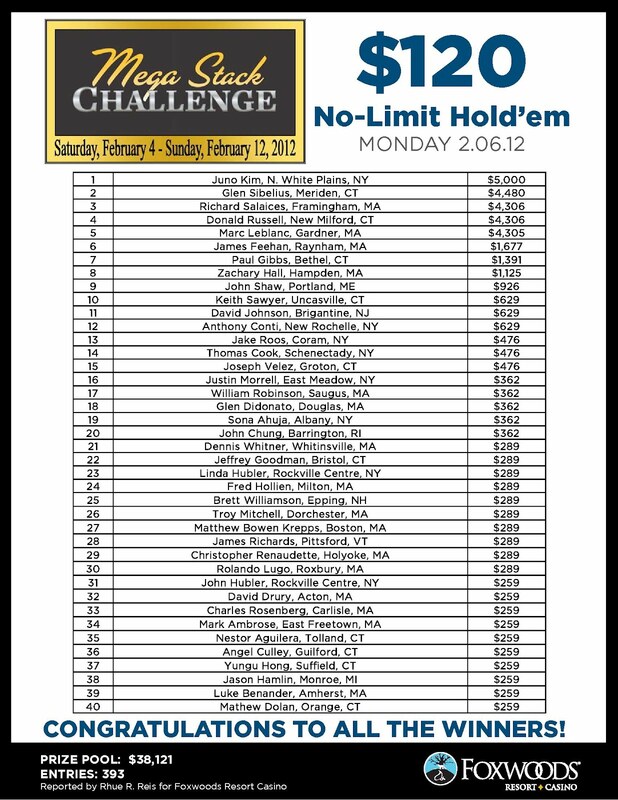 Everyone still remaining has locked up at least $1,013, with first place good for $46,253. Tune in to our live stream tomorrow to see who will win the title and the trophy! We don't know their names, yet, but two players are our live featured table have over a million in chips each. Which one in the photo do you like more? The player on the left who stacks them high, or the player on the right who has more stacks?